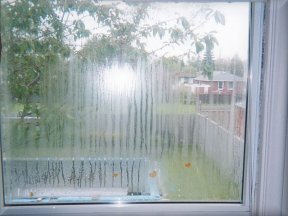 Solve your foggy window condensation problems for less cost than a complete window replacement due to the removal cost of your old window. After exhausting cleaning effort with no results the average consumer typically comes to the conclusion the only recourse to their "foggy" window problem is an unnecessary complete window replacement. However, that is not true! 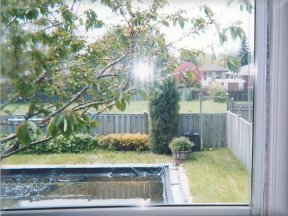 A "foggy" window delimma can actually be cured more cost effectively by simply replacing the glass. A foggy window is actually a chemical reaction caused by the insulator around the perimeter of the window. We are your Cost-Effective, No-Hassle Solution. During the production of a double paned insulated window, around the perimeter between the panes there is a shiny chrome insulator filled with tiny chemical balls, which are activated by extreme heat designed to remove all air and moisture from between the panes when the unit is made. By removing both the air and moisture, the space between the panes should be dead and efficiently insulated. Finally the unit can be sealed and installed into an existing window frame. Once installed, after a period of approximately 10 years, the unit has been continually subjected to constant expansion and contraction from heat and cold resulting in the glass releasing itself from the insulator and allowing both air and moisture to enter between the two panes. Because the insulator is designed to be heated only once in the manufacturing of the unit, a permanent damaging "foggy" effect begins to occur. Initially recognized as just fog as if it were a cold damp day, the reaction then progresses to a weepy wet appearance. The final progression can be seen as a white powdery substance that conclusively results in permanent etching of the glass. Contact Quick Glass, your foggy window specialist to solve your window problems today! Foggy windows are not very appealing to the eye. Window condensation reduces the windows ability to insulate you from the outside temperatures, defeating the purpose of having thermopane windows. Not only will a foggy window will reduce visibility it will also reduce the "R-Value" of your windows. Call Quick Glass, your foggy window specialist to repair your ugly fogged glass and bring your window back to it's original clear clean state for just a small fraction of the cost of a new replacement window. For over three decades your foggy window specialists at Quick Glass have committed ourselves to providing solutions to the foggy window problem. Our mastered technicians promise to deliver exceptional customer service, top of the line products, and a competitive and affordable price. We are happy to provide a free no obligation consultation at your convenience. If you have any questions or would like to schedule your estimate today, please do not hesitate to call your foggy window specialists at 817-925-6229. For your convenience, you may also request services from this site.